Whoa! I didn’t know batcomputer worked on punchcards classic! ah too good. Do you have any rolls of tape leftover!? 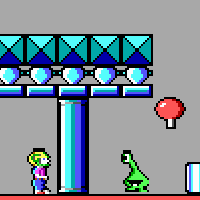 sorry @jonne my game is not commander keen it is jetpack https://en.wikipedia.org/wiki/Jetpack_(video_game) clone. … but nevermind, JetPack is a cool game also! So are @Hanski and the ‘Batcomputer’ going to be the only judges? Wow, those entries look amazing! Please update my entry to the latest version with AAA production value (sound effects). Fantastic! I spent countless hours with Jetpack on my first PC. It was actually one of the games I considered for this competition, but decided to go with ScummPy instead. Now we have them both on Pokitto! I have one suggestion for the game. You get 10 points for every photo. But if you are brave, and “stay close” to get more photos, you should get more and more points for successive photos. this could make the game more fun, because you have to take a risk to get more points! Hi, looks really great! Added to the list. Your entry is fantastic though!